In some cases we cannot be sure if someone has glaucoma or not and the patient is then classified as a glaucoma suspects. Glaucoma suspects are tested periodically to make sure that the imaging studies and visual fields are not changing. 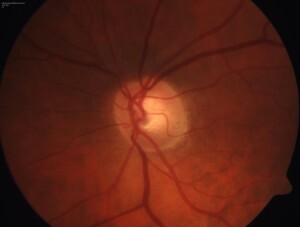 Increase of the cup/disk ratio or thinning of the retinal nerve fiber layer, or visual field defects, may be trigger a change in the designation from glaucoma suspect, borderline glaucoma or ocular hypertension to frank glaucoma. In patients who already are known to have glaucoma, monitoring for progression (or changes) of function or structure signals whether or not the current therapy is holding the line of the disease. If everything looks the same visit after visit, the condition is stable. 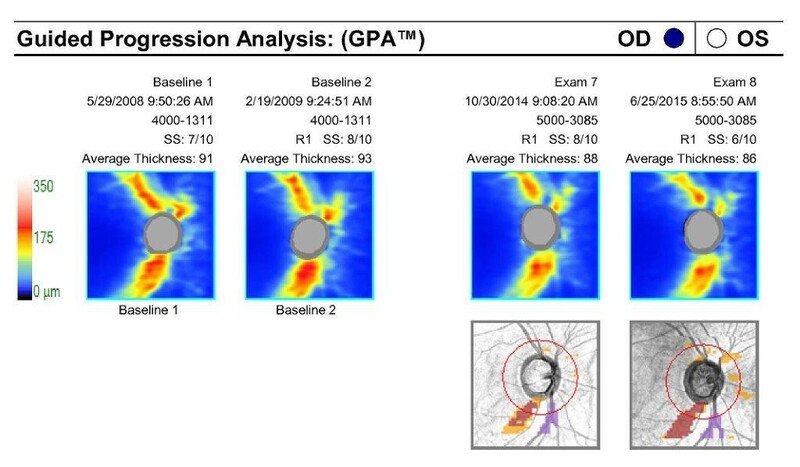 If the structural or functional test worsens, the glaucoma is said to be progressing as shown by the Guided Progression Analysis: (GPA) below. This test requires dilation of your pupil. Two pictures of each optic nerve are taken, separated by 7 degrees. When these two images are projected side by side and viewed with a special device, a 3-dimensional or stereo-view of the optic nerve contour is possible. This method is considered as the “gold standard” in optic nerve image. Stereo photography can pick up changes in cupping by comparison of the original photos with current ones. We combine stereo photography with RNFL analysis.